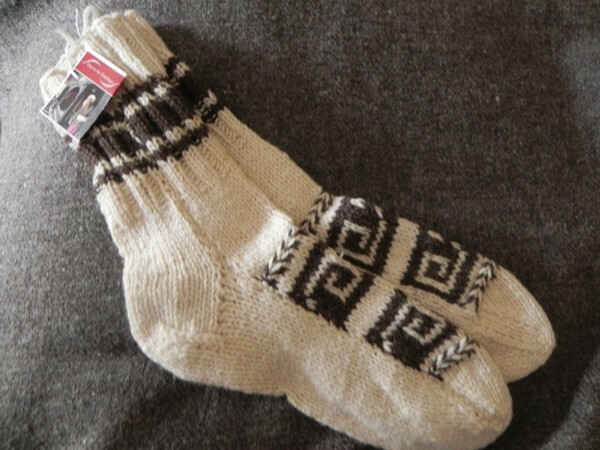 Incredibly warm these ladies Himalayan sheep's wool socks are hand spun and hand knitted for Door to the Himalayas by ladies from the Botiya Tribe. They are shepherds wives who live in mountain villages up near the source of the Ganges on the Indo-Tibetan border. Since 2010 we have been working directly with these ladies to provide a sustainable route to market for their wonderful hand knits. The patterns will vary depending on which who has knitted your pair of socks amd depending on whatever design she feels like creating. Every pair is so wonderfully unique.